* Collaborate in the coordination of technical requirements for YPT productions. * Assist in the coordination of build schedules for YPT productions, in consultation with production department heads. * Assist in the coordination of set-ups, strikes and maintenance calls for YPT. * Assist with supervising, when required, the work on the mainstage or in the studio. * Assist in the co-ordination with community rentals for all operational and technical and staffing requirements. * Assist and participate in the company’s Education & Participation programs and events as requested by management. * Provide production and operations support for various YPT events and activities as required. * Assist in facility maintenance, upkeep, custodial work, and repair. * Be available for occasional evening and weekend work. * Graduate of a recognized theatre program. 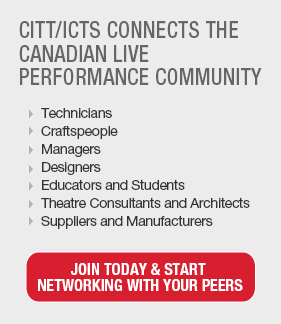 * Basic knowledge and experience with all aspects of technical theatre and building operations. * Knowledge of Vectorworks drafting software and MS Office applications. * Experience in creating production schedules and managing crews an asset. * Strong attention to detail and motivated by safe work practices. * Strong interpersonal, leadership, time and resource management skills. Solution-based problem solving an asset. * Experience with working at heights. * A Valid Ontario Class G Driver’s license (or equivalent) is required. * Knowledge of IATSE working environments an asset. * Knowledge of health and safety regulations and practices an asset. * In accordance with YPT’s policy and as a condition of employment, the successful candidate will be required to pass a satisfactory Police Vulnerable Sector Screening Check. Young People’s Theatre is proud to be an equal-opportunity employer that strongly supports and values diversity and fosters an equitable and inclusive work environment that includes accommodation. Applications from all qualified candidates are welcome, and people with disabilities and individuals from equity-seeking groups are encouraged to apply. Young People’s Theatre (YPT), celebrating its 53nd Anniversary Season in 2018/19, is Canada’s largest professional theatre for young audiences company. It currently produces and presents an 8-play season with an audience of approximately 80,000+. Housed in a renovated historical venue in downtown Toronto, YPT works on a 458-seat Mainstage and a 115-seat Studio, as well as operating a year-round Drama School in four locations. The family-friendly employee culture at YPT (given that hours are primarily day time) encourages ingenuity, team-work, and an atmosphere of learning. YPT’s artistic policy focuses on arts and education – in fact, learning is at the centre of everything we do.